No more night time discomfort. All Night Disposable Briefs are specifically designed to allow for an uninterrupted night's sleep without compromising skin safety. The patented "peach mat construction" guarantees dryness, odor control, and neutralization of urine. Most importantly it inhibits the growth of bacteria. 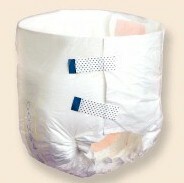 With a soft, cloth-like backing these overnight briefs provide the utmost in quality and comfort for your child. These all night disposable briefs are available in three sizes: xsmall, small and medium. See the chart below for specific sizing information. What better toy to have in your house, or classroom, then a toy that provides children with playtime that enhances balance, reflexes, and hand-eye coordination! These high performance briefs deliver superior absorbency. They were designed specifically to keep the user dry and clean for extended periods of time.